Quick knitting and freakishly warm. If you're a Harry Potter fan, knit these in your favorite House colors. If you could care less, they're still pretty cool. One skein each Lion Brand Wool Ease Worsted Weight, 1 Navy, 1 light grey (or pick your own dang colors!) I have plenty of grey leftover and enough blue that I can probably make a watchcap or tam grey with blue stripes. If you're up for total cuteness (which I try to avoid), you might do one arm warmer with one stripe pattern, and reverse the stripe pattern for the other. These go all the way up to my elbows, and I'm rather tall, so your mileage may vary. Size 5 dpns (US). This will give a thick fabric. In MC, CO 45 stitches, join without twisting. Work 10 rows k2 p2 rib, ending with p1 (this will be a 'seam' stitch out of which your thumb gusset will grow). Begin stripe and cable pattern this way: (Row 0) Knit 14, p2, k6 p2, knit 20, p1. (The k2 will be your cable). You will knit 11 rows MC, 2 rows CC, 2 rows MC, 2 rows CC. Repeat this 16 round stripe pattern as many times as you wish. As you stripe, do a 3/3 cable. For the left armwarmer, I did a 3CF: slip 3 stitches to cable needle, hold in front, knit next three stitches, slip three stitches off cable needle, and knit them. I cabled on round 11, and then on round 2 (I didn't cable the first round two, I was trying to set up the pattern!) Putting stripe and cable pattern together: This means that the row before you change color and the row after you change color back to MC will be cabled. Feel free to just do one cable crossing every 8 rows, or heck, pick a different cable! Do 5 repeats of cable/stripe pattern, or whatever length you want down to your wrist. As you continue this pattern for the 6th time, increase thumb gusset this way in that purl 'seam' stitch that's ended every round. R1: p in front and back of purl stitch. R10: Bind Off ten stitches in purl. Next round, CO one stitch to cover gap. 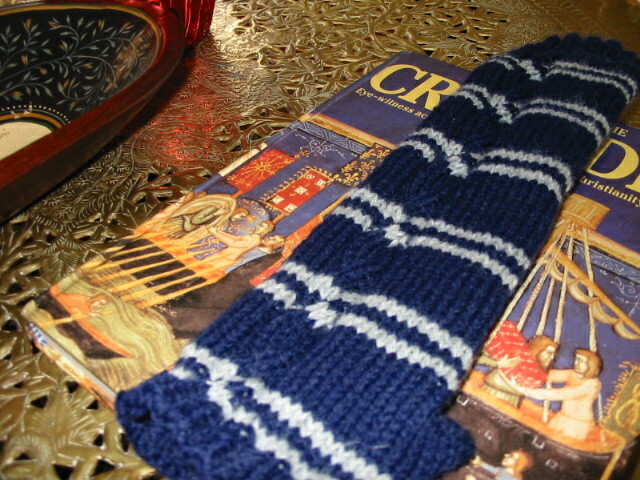 I did six more rows (the trapped bar color stripe with cable crossings) after I did the thumb hole. Then I did 5 rounds k2 p2 rib (ending p1) and then bound off in pattern. Set up row for cable pattern (Row 0): knit 20, p2, k6, p2, k14, p1. Do reverse cables: Slip three stitches to cable needle, hold in BACK of work, knit three stitches, slip three stitches off of cable needle and knit them. Other than that, work the same. I just like the symmetry. Hey, it's hard to get a picture of these on your own body! Trust me, they're cute!